Interactions with law enforcement and some communities across the United States definitely need improvement, including Gwinnett County, Georgia. There is good law enforcement in the county for some communities, but there have also been abuse of power issues and questionable expenditures in the county. Additionally, Gwinnett County is working with U.S. Immigration and Customs Enforcement (ICE)/Trump Administration on deportations under the federal program 287(g), representing 20% of all encounters nationwide so far in this year. To address the concerns of the community and begin building better relationships, on June 21, 2018, I hosted the “Gwinnett County Law Enforcement and Community Relations Forum.” The forum was open to the public and all stakeholders with personally invited guest including residents of Georgia State Senate District 9, Gwinnett County Sheriff Butch Conway, law enforcement top officers of Gwinnett County cities in the district, community organizations, and other stakeholders. Over 100 residents, community organizations and stakeholders showed up, but Gwinnett County law enforcement did not! Zero. Cero. Nada. 제로. Naught. صفر. Zilch. Zip. But here’s the most troubling part of this story. A true nerd, analytics are my thing. After the event, the engagement numbers for the invitation really blew me away and scared me at the same time. Out of 28 emails of the invitations sent on June 14, 2018, it was opened by 549 unique computers – 74% desktops, 20% mobile phones and 6% tablets. The residents of Gwinnett County showed up on June 21, 2018, but the law enforcement community hired to protect and serve these same residents did not show up. Just let that settle with you for a minute. 28. 549. 0. These numbers made me have so many questions? Who were the recipients of the forwarded invitations? Did everyone just so happen to individually decide not to attend or was it a collective decision? Was the invitation forwarded to people outside of invited law enforcement? Do residents of Gwinnett County not matter to law enforcement here? A wife of a police officer working in Gwinnett County attended the community conversation. She heard about the event from someone other than her husband. “I know my husband didn’t receive an email, because I read all of his emails,” she said. Law enforcement is vital in our county, state and country. Members of law enforcement have the responsibility to protect and serve the community, and the residents and stakeholders must be able to respect and trust law enforcement members. We appreciate our law enforcement officers, and we thank each one for their service. But in some of our communities, there is a breakdown in law enforcement relations. Across the country, we are witnessing alarming rates of police brutality, killing of unarmed people, a mistrust of law enforcement in communities, and immigration challenges. Recently CBS News reported that “Gwinnett County accounted for 20 percent of all 287(g) encounters last year, by far the most nationally.” There are over 3,000 counties in the United States, and Gwinnett’s numbers are alarming. That is one of the reasons I wanted to have this community conversation. Gwinnett County Sheriff Department has been recently featured on A&E’s “Live PD.” As reported by The Atlanta Journal-Constitution, the reality show features “…live broadcasts of police officers from around the country performing routine duties. Each episode toggles between multiple departments throughout the night, showing officers responding to calls ranging from drug possession and assault to stray animals in backyards. In the AJC article, Sheriff Butch Conway is quoted saying “I’m proud of our deputies and think this project [“Live PD”] will give citizens a greater appreciation for the good work they do.” The citizens of Gwinnett County who attended this community conversation would have appreciated meeting law enforcement personally in a situation other than when performing their duties of policing neighborhoods. Thank you to those who came out for this community conversation. I look forward to the next community conversation on issues important to residents of Gwinnett County. 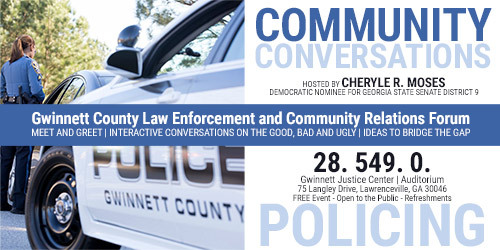 And of course I will invite Gwinnett County law enforcement to attend an upcoming community conversation and hopefully the numbers will change from the very disappointing 28. 549. 0. 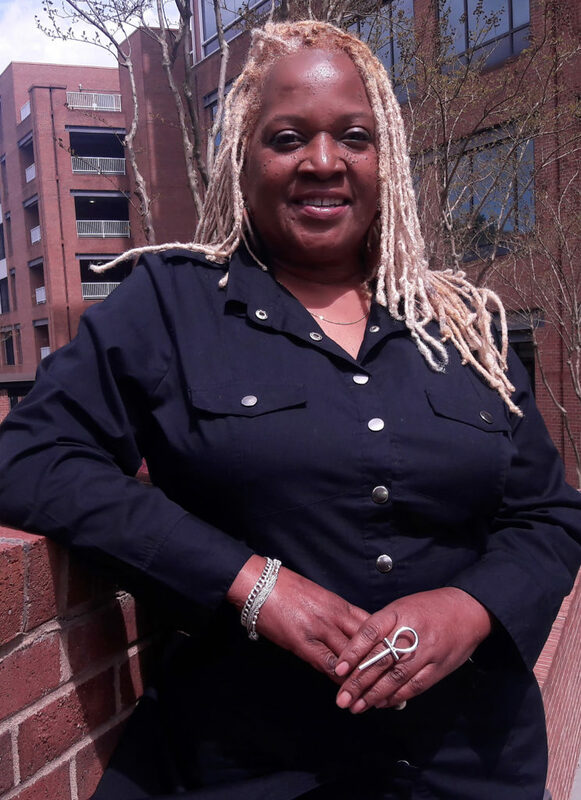 Cheryle R. Moses, Democratic nominee for Georgia State Senate District 9 in Gwinnett County and the publisher of BlackGwinnett Magazine. Moses will host a community conversation on Friday, August 24, 2018, 6:00-8:30p – kicking off Gwinnett County Women’s Equality Weekend 2018 sponsored by BlackGwinnett Magazine, Camrose Creative Services, Urban Mediamakers and WeCodeAcademy. Need more information? Contact us at 404.386.5353 with questions and comments. Good writing, good content, great looking magazine Cheryle! You’ve become a publishing and political dynamo in Gwinnett — a riveting and robust visionary and voice of the people. You are a beautiful and brilliant leader. That’s why I look forward to your victory in Georgia Senate District 9. As a seasoned and savvy journalist, I salute and applaud you as one helluva story young lady! God’s Best Always.